Hire Us – We can help! Cab Grid currently offers two additional ‘widgets’ – that is, functional blocks that can be added to your site’s sidebar (typically) or any other widget-enabled area in your WordPress theme. Both the basic and pro versions of Cab Grid offer the main taxi fare price calculator panel as a widget. 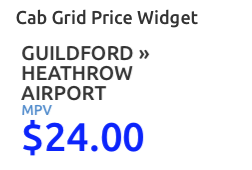 This widget appears on the Widgets page of your Wordpress Admin, simply labelled ‘Cab Grid‘ (basic version) or ‘Cab Grid Pro‘. In the basic version there are few options. You can specify a title which appears above the price calculator and set the amount of vertical space (height) the Cab Grid widget should occupy in your sidebar. The pro version offers the same title and height options, but also adds layout choices (passenger & luggage/vehicle/ticket/time) and the ability to specify the area groups each widget instance displays. With area groups you have the ability to add several widgets each providing a different set of journey prices. 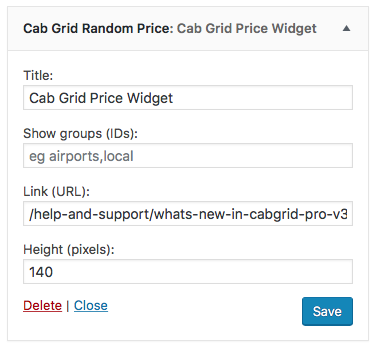 In Cab Grid Pro v3 we introduced a new widget aimed at enhancing your site with eye-catching lead prices or offers. 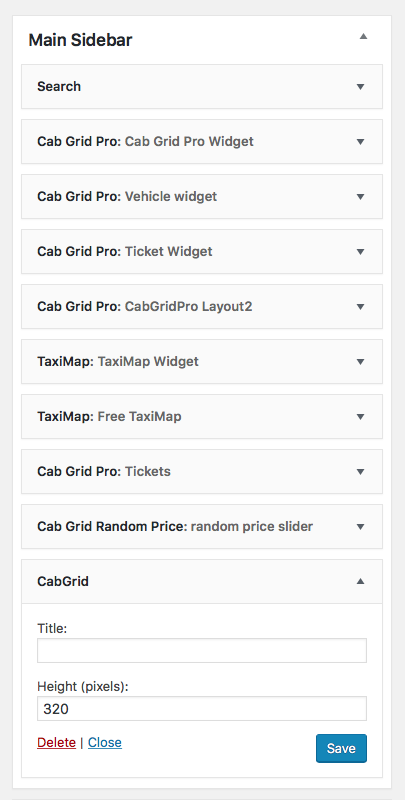 The ‘Cab Grid Random Price‘ widget displays a panel in your sidebar showing random journey prices via an infinite slider. As with the main widget (detailed above) you can specify a title and define the vertical space (height) the widget occupies. And, again, you can also use area groups to limit the prices that are shown by this widget. Only journeys that have prices defined will be shown. Journeys are chosen at random, only limited by groups (if defined). The only other option this widget allows is a URL (or link) that the visitor is sent to when they click the widget itself. Typically, you would link to your main pricing page or enquiry/quote form. Troubleshooting – Cab Grid not working?